As investor confidence in the EB-5 Program has grown, so have the opportunities to develop new markets to bring even more job-creating capital to the U.S. Invest in the USA (IIUSA), the national not-for-profit industry trade association for the EB-5 Regional Center Program (the “Program”), recently published the first-of-its kind EB-5 Investor Markets Report, a quantitative and qualitative analysis of established and emerging EB-5 investor markets. The report will be updated annually going forward. The EB-5 Investor Markets Report is the first comprehensive analysis of investor market demand, bringing into focus the countries and regions poised for growth in the years ahead. IIUSA has accumulated a complete historical dataset for 1992-2014. Every country in the world with market data is assigned a “growth score”, allowing objective trend comparisons of various countries and regions against the average growth of the industry over various time spans. Since 2008, EB-5 has contributed over $13 billion in foreign direct investment to the U.S. that supports tens of thousands of jobs and transforming communities across the country through successful regional economic development projects. The newly published Investor Markets Report will further the industry’s understanding of the factors driving international market growth and highlights the markets that will continue to drive U.S. economic development all at no cost to the U.S. taxpayer. 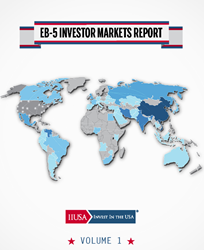 The EB-5 Investor Markets Report is available for download for free at IIUSA.org. To download the report, click here. Founded in 2005, IIUSA is the national not-for-profit trade association for the EB-5 Regional Center industry with a mission of advocacy, education, industry development, and research. The organization represents more than 275 Regional Centers and 200 Associate members, collectively representing big and small projects, urban and rural economic development, and industry sectors ranging from real estate and manufacturing to energy and infrastructure. IIUSA’s members are engines of economic growth and job creation, accounting for over 95 percent of capital flowing through the Program. Learn more at IIUSA.org.